TRIBUTES are being paid today following the death of "fearless peacebuilder" Bishop Edward Daly. The Fermanagh-born former Bishop of Derry, who had been ill in hospital, passed away this morning with members of his family at his bedside. He was best known from an iconic photograph in which he, as a 39 year old priest, raised his blood-stained handkerchief to secure passage for a mortally wounded victim during Bloody Sunday 1972. 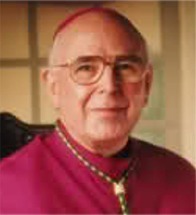 Catholic Primate of All Ireland Eamon Martin was ordained by Dr Daly in 1987. He described him as "an iconic figure in the civic and church life of Ireland, north and south". "Bishop Edward will be remembered as a fearless peacebuilder - as exemplified by his courage on Bloody Sunday in Derry - and as a holy and humble faith leader." Bishop of Derry Donal McKeown said he had served, "without concern for himself throughout the traumatic years of the Troubles, finding his ministry shaped by the experience of witnessing violence and its effects". "The bishops, priests and people of the diocese were blessed to have such a dedicated and faithful priest among them," said Dr McKeown. The Church of Ireland Bishop of Derry and Raphoe Ken Good also paid tribute and offered his condolences to Dr Daly's family. "He was a man of great strength, great courage and great compassion and set an inspirational example to everyone around him. "Bishop Daly provided unwavering Christian leadership and guidance when it was desperately needed in this city and community – during the darkest days of the Troubles. His deep friendship with my predecessor, Bishop James Mehaffey, provided an impressive and influential example of Christian witness." For funeral arrangements click here .